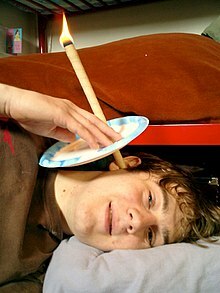 Ear candling, also called ear coning or thermal-auricular therapy, is an alternative medicine practice claimed to improve general health and well-being by lighting one end of a hollow candle and placing the other end in the ear canal. Medical research has shown that the practice is both dangerous and ineffective and does not help remove earwax or toxicants. Edzard Ernst has published critically on the subject of ear candles, noting, "There is no data to suggest that it is effective for any condition. Furthermore, ear candles have been associated with ear injuries. The inescapable conclusion is that ear candles do more harm than good. Their use should be discouraged." According to the US Food and Drug Administration (US FDA), ear candling is sometimes promoted with claims that the practice can "purify the blood" or "cure" cancer, but that Health Canada has determined the candles have no effect on the ear, and no health benefit; instead they create risk of injury, especially when used on children. In October 2007, US FDA issued an alert identifying ear candles (also known as ear cones or auricular candles) as "dangerous to health when used in the dosage or manner, or with the frequency or duration, prescribed, recommended, or suggested in the labeling thereof" ... "since the use of a lit candle in the proximity of a person's face would carry a high risk of causing potentially severe skin/hair burns and middle ear damage." Ear candling also should be avoided. Ear candling is a practice in which a hollow candle is inserted into the external auditory canal and lit, with the patient lying on the opposite ear. In theory, the combination of heat and suction is supposed to remove earwax. However, in one trial, ear candles neither created suction nor removed wax and actually led to occlusion with candle wax in persons who previously had clean ear canals. Primary care physicians may see complications from ear candling including candle wax occlusion, local burns, and tympanic membrane perforation. Material that appears after ear candling, sometimes alleged to be earwax and toxins, was found to be residue from the candle itself. The Spokane Ear, Nose, and Throat Clinic conducted a research study in 1996 which concluded that ear candling does not produce negative pressure and was ineffective in removing wax from the ear canal. Several studies have shown that ear candles produce the same residue when burnt without ear insertion and that the residue is simply candle wax and soot. As of 2008[update], there are at least two cases in which people have set their houses on fire while ear candling, one of which resulted in death. A survey of ENT surgeons found some who had treated people with complications from ear candling. Burns were the most common. In Europe, some ear candles bear the CE mark (93/42/EEC), though they are mostly self-issued by the manufacturer. This mark indicates that the device is designed and manufactured so as not to compromise the safety of patients, but no independent testing is required as proof. While ear candles are widely available in the U.S., selling or importing them with medical claims is illegal. This means that one cannot market ear candles as products that "Diagnose, cure, treat, or prevent any disease". In a report, Health Canada states "There is no scientific proof to support claims that ear candling provides medical benefits. ... However, there is plenty of proof that ear candling is dangerous." It says that while some people claim to be selling the candles "for entertainment purposes only", the Canadian government maintains that there is no reasonable non-medical use, and hence any sale of the devices is illegal in Canada. In a paper published by Edzard Ernst in Journal of Laryngology & Otology, the cost of practicing ear candling according to the recommended frequency of use is estimated. As each candles costs $3.15 USD (adjusted for inflation), the annual cost of the treatment would amount to $982.00 USD (also adjusted for inflation). The author calls the continued practice of the treatment "a triumph of ignorance over science ... or perhaps a triumph of commercial interests over medical reasoning." Although Biosun, a manufacturer of ear candles, refers to them as "Hopi" ear candles, there is no such treatment within traditional Hopi healing practices. Vanessa Charles, public relations officer for the Hopi Tribal Council, has stated that ear candling "is not and has never been a practice conducted by the Hopi tribe or the Hopi people." The Hopi tribe has repeatedly asked Biosun, the manufacturer of 'Hopi Ear Candles', to stop using the Hopi name. Biosun has not complied with this request and continues to claim that ear candles originated within the Hopi tribe. Many advocates of ear candles claim that the treatment originates from traditional Chinese, Egyptian, or North American medicine. The mythical city of Atlantis is also reported to be the origin of this practice. ^ a b c Seely, D.R. ; Quigley, S.M. ; Langman, A.W. (1996). "Ear candles: Efficacy and safety". Laryngoscope. 106 (10): 1226–9. doi:10.1097/00005537-199610000-00010. PMID 8849790. ^ Beatty M.D., Charles W. "Ear Candling: Is it Safe?". MayoClinic.org. Mayo Clinic. Retrieved 7 June 2014. ^ Edzard Ernst (2004). "Ear candles: a triumph of ignorance over science". The Journal of Laryngology & Otology. 118 (1): 1–2. doi:10.1258/002221504322731529. PMID 14979962. ^ Singh, Simon. ; Ernzt, E. (2008). Trick or Treatment: Alternative medicine on trial. Bantam Press. ^ Food and Drug Administration (ed.). "Don't Get Burned: Stay Away From Ear Candles". WebMD. Retrieved 2016-08-17. ^ a b "Detention Without Physical Examination of Ear Candles". Archived from the original on 2007-11-14. Retrieved 2007-11-17. ^ J. Rafferty; MB CHB; A. Tsikoudas; FRCS DLO; B.C. Davis; FRCS ED (1 December 2007). "Ear candling: Should general practitioners recommend it?". Can Fam Physician. 53 (12): 2121–2. PMC 2231549. PMID 18077749. ^ "The Straight Dope: How do "ear candles" work?". 1995. Retrieved 2006-03-21. ^ "Listen up: Beware of the 'ear candle'". CBC Marketplace. 2002-02-22. Archived from the original on 2013-06-01. Retrieved 2016-08-17. ^ Joe Schwartz (30 August 2008). "Don't put a candle in your ear and save $25". Montreal: Montreal Gazette. p. I11. Archived from the original on 28 June 2011. ^ Holloway, R (1997-04-01). "Ear candles—Efficacy and safety: Seely DR, Quigley SM, Langman AW. Laryngoscope 106:1226, 1996". Journal of Oral and Maxillofacial Surgery. 55 (4): 431. doi:10.1016/S0278-2391(97)90150-6. ^ Phylameana lila Desy. "Ear Candling:Why Would You Want to Candle Your Ears?". About.com. ^ Goldacre, Ben (2004-03-04). "Waxing sceptical". The Guardian. Retrieved 2007-02-25. ^ "It's your health: Ear Candling" (PDF). Health Canada. Retrieved 2007-11-15. ^ a b Bromstein, Elizabeth (13 January 2005). "Wax on, wax off: Does candling clear canal or burn it?". NOW Magazine. Archived from the original on 5 October 2010. Retrieved 25 February 2007. ^ Ernst, Edzard (2004-01-01). "Ear candles: a triumph of ignorance over science". The Journal of Laryngology & Otology. 118 (1): 1–2. doi:10.1258/002221504322731529. ISSN 1748-5460. PMID 14979962. ^ "Authenticity of the Hopi Candle". Active Health. 2004-03-02. Archived from the original on August 23, 2006. "The Hopi Cultural Preservation Office is not aware of Hopi people ever practicing 'Ear Candling.' Biosun and Revital Ltd. are misrepresenting the name 'Hopi' with their products. This therapy should not be called 'Hopi Ear Candeling.' [sic] The history of Ear Candeling [sic] should not refer to being used by the Hopi Tribe. Use of this false information with reference to Hopi should be stopped." ^ "Hopi Ear Candles". Biosun. Archived from the original on 2011-04-13. "The Hopi, the oldest Pueblo people with great medicinal knowledge and a high degree of spirituality, brought this knowledge to Europe with the professional involvement of BIOSUN." ^ Roazen (M.D. ), Lisa (2010-05-12). "Why Ear Candling Is Not a Good Idea". www.quackwatch.com. Retrieved 2015-11-03. Wikimedia Commons has media related to Ear candling.